Loki the Komodo dragon. Photo by Ryan Hawk/Woodland Park Zoo. 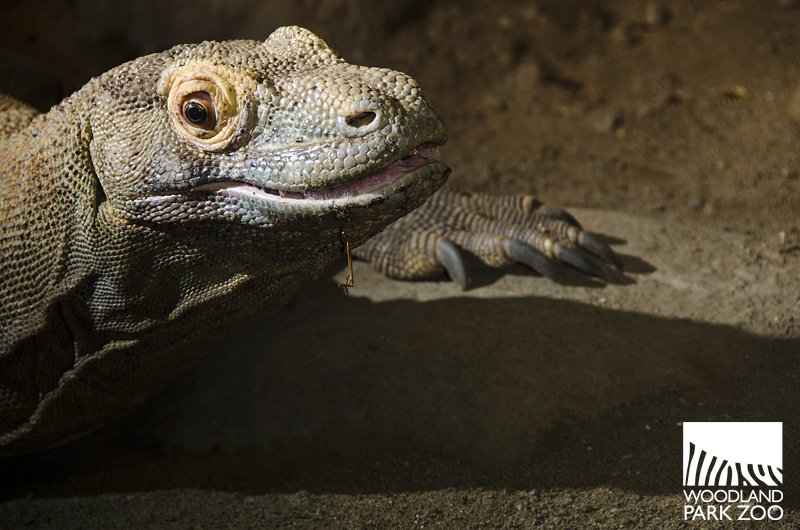 Woodland Park Zoo said goodbye this week to a long-time resident, 19-year-old Komodo dragon Loki. Loki’s mobility had been declining over the past year from chronic age-related degenerative joint disease. Keepers had given him supportive care, but we ultimately had to make the tough but humane decision to euthanize him this week once he lost his appetite and developed breathing difficulties that did not respond to treatment. The Buddha said, “The energy of life is neither created nor destroyed. It moves along from one sentient being to the next.” This week the energy of Loki’s life passed onto its next place. Part will always feel as if it’s with me. We have worked with each other for eight years. We have learned that old dogs (lizards actually) can learn, and learn new tricks much less. I have seen his power, his grace, his agility and his sneakiness. His dining manners were always less than aristocratic, but nevertheless, awe inspiring. Loki reminded me of valuable lessons: explore fearlessly, learn enthusiastically and never give up, even when your body tells you it can’t go on. I’m sure the spirit of Loki will live on in the new generation of Komodo Dragons. I already see it in the glint in their eyes. The zoo recently welcomed two young Komodo dragons to our collection. They will make their way onto exhibit this fall. Selat, the zoo’s other adult Komodo dragon, remains on view. We also said goodbye to another elderly resident, KC, a 23-year-old elk who was also euthanized due to age-related mobility issues this week. We want to take this opportunity to recognize the tremendous care and comfort our zookeepers and the zoo’s animal health staff provides our animals all the way into their old age. Thank you for all you do. I have volunteered at the zoo for many years and have found all of the keepers I have worked with to be very caring and in tune with what an animal needs and go to great lengths when an animal is sick. They feel so bad when they loose an animal. Peter's thoughts of Loki were very beautiful and brought tears to my eyes. My daughter -- about to turn 14 -- was absolutely entranced by the dragons when she was a toddler. She would make her unsteady way up to the glass, and Loki would always come check her out. (Anything that small and awkward is a possible meal, isn't it?) She used to brag that 'the Komodo Dagons love me' and I agreed. Farewell to a fantastic example of the world's most impressive reptile. I look forward to seeing the youngsters when they go on display. Thank you again for getting us these rare animals to observe and enjoy. I had dreamed of seeing one since I was a toddler myself--for me, WPZ getting Komodo Dragons is a dream come true.